Unfortunately Bald Eagles are still endangered in some areas, although they may be removed from the endangered list soon. In the late 1800s Bald Eagles were almost extinct. One of the reasons were the loss of their habitat as more humans migrated westwards. Bald Eagles are one of the largest members of the "birds of prey" category. The wingspan of a Bald Eagle can reach up to 85 inch! 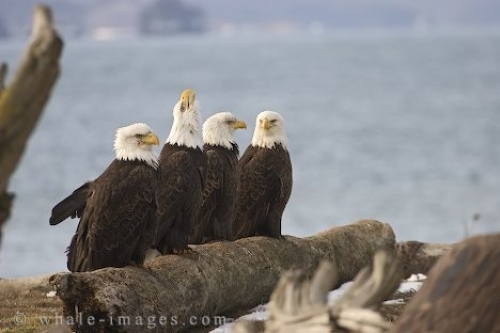 Funny Picture of four endangered Bald Eagles sitting on a log, looks like they are having a conference.